NeoRecruit is now compatible with Joomla 2.5 ! We are proud to announce you that the 3.0 version of the NeoRecruit component is now available. A few weeks after the release of the latest version developed for Joomla! 1.5, it is now a new cycle that is beginning with this version for Joomla! 2.5. Note that this version is compatible with Joomla! 1.6 and 1.7 too. 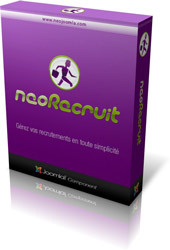 Download NeoRecruit 3.0 for Joomla 2.5.